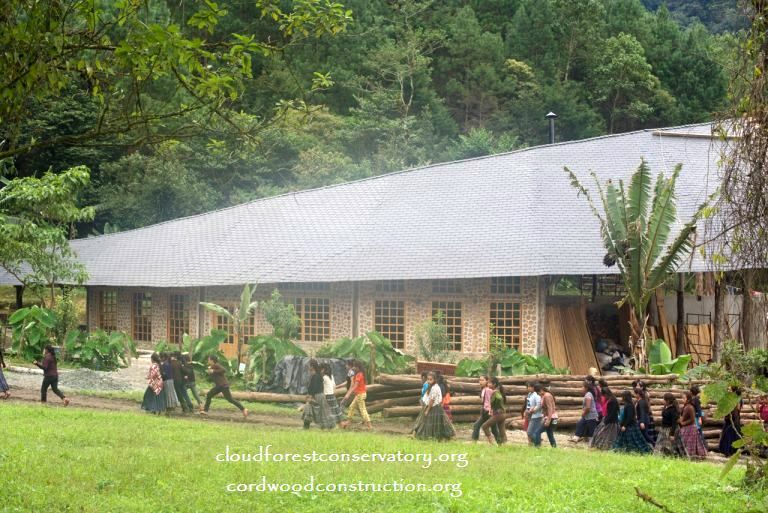 The 95 foot long Quetzal Cordwood Classroom is located in the rain forest near Coban, Guatemala. 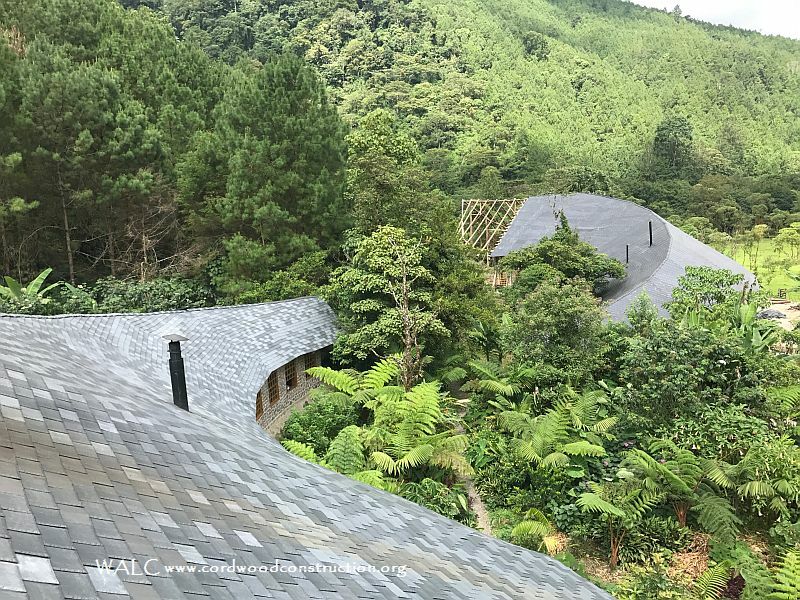 Built by the Community Cloud Forest Conservation it is a long curved structure that resembles the tail feathers of the Quetzal (the national bird). 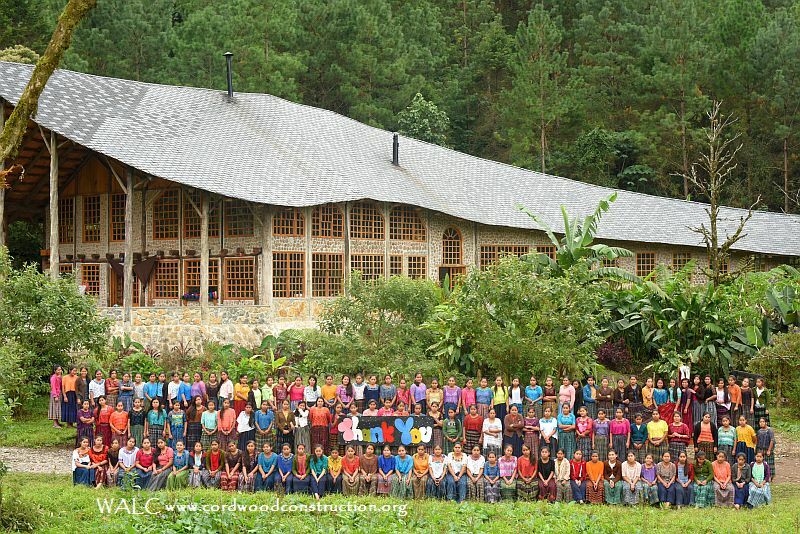 These buildings house classrooms, kitchens and dormitories that serve the middle school girls from the area. 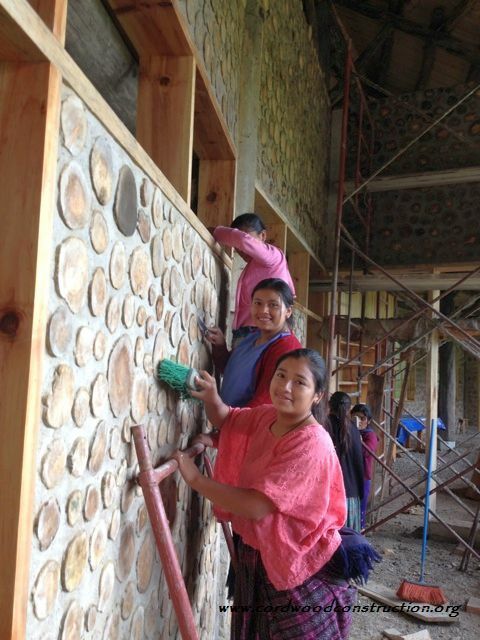 The girls are able to continue their education and learn skills that are income producing. 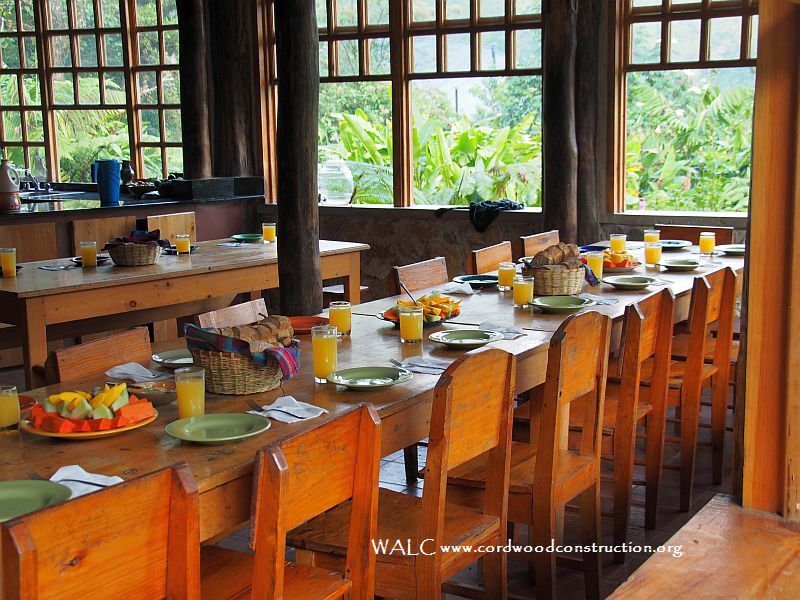 Many volunteers and organizations have helped in the support and construction of this wonderful community. Rob & Tara Cahill are the Directors. The shingles are recycled tires and are donated by a Canadian shingle company. They are guaranteed to last for 100 years. A comforting thought in the rain forest! 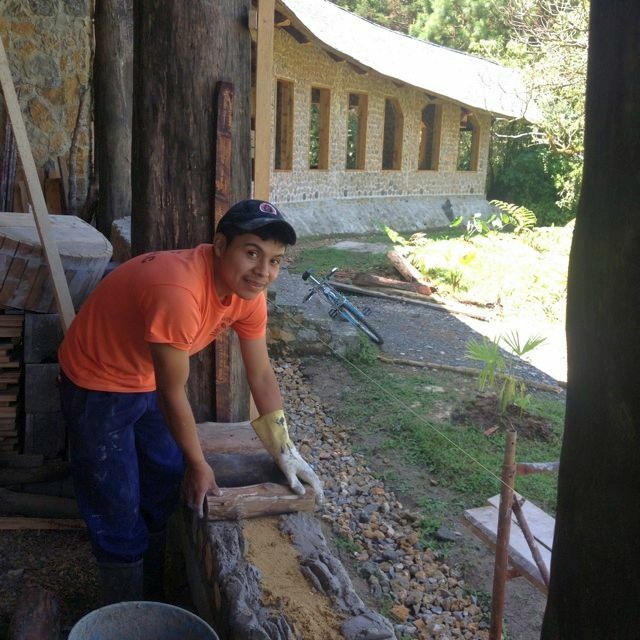 The Quetzal’s have high stone foundations to funnel the ever-present rainwater away from the buildings. The cafeteria is bright and colorful. 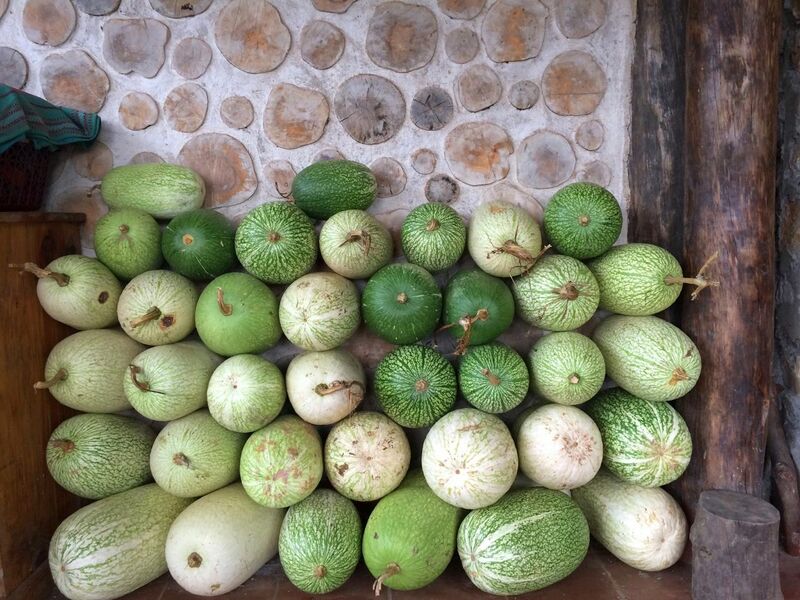 The community grows traditional fruits and vegetables (local squash is pictured above) and has an industrial kitchen to make jams, jellies and salsas to sell on the world market. 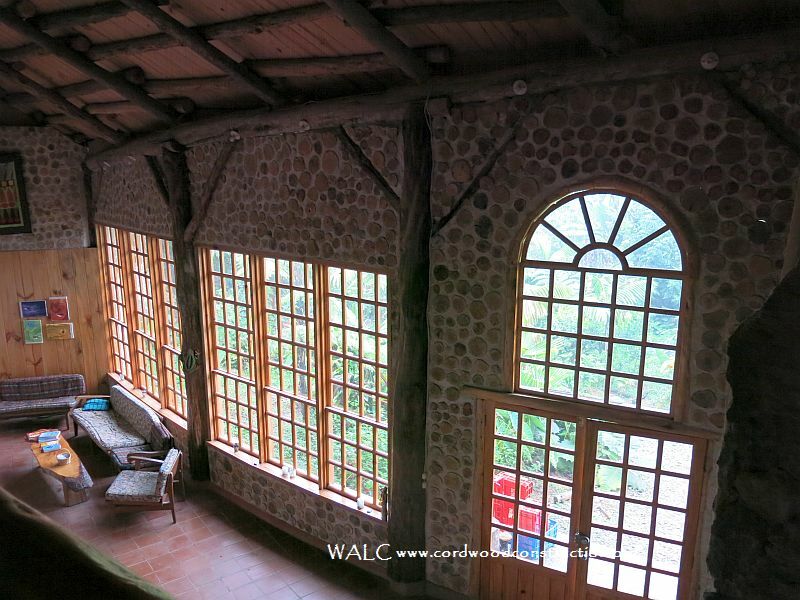 The beautiful windows are handmade by local artisans. Students learn valuable skills that help them with high school and employability. 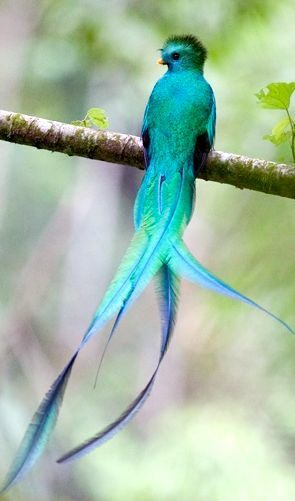 The Quetzal is the national bird of Guatemala. 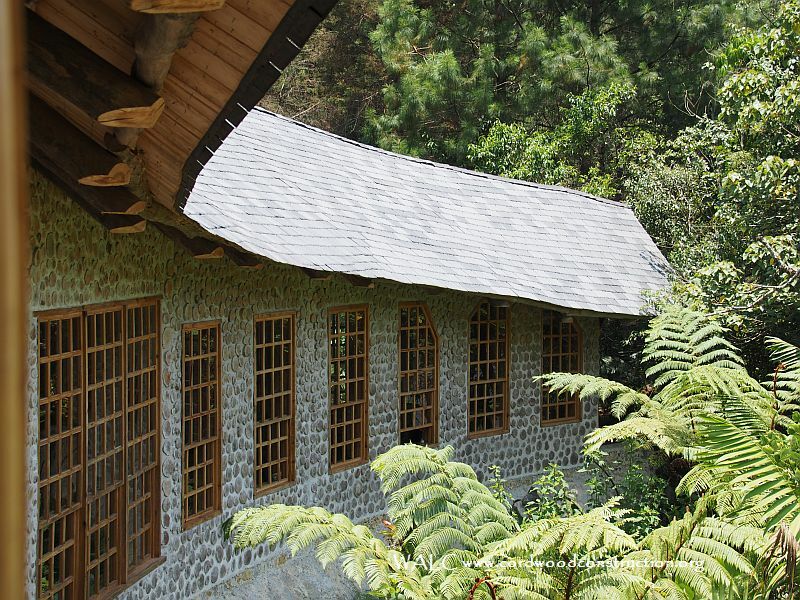 The tail feathers of the Quetzal are the inspiration for the buildings. 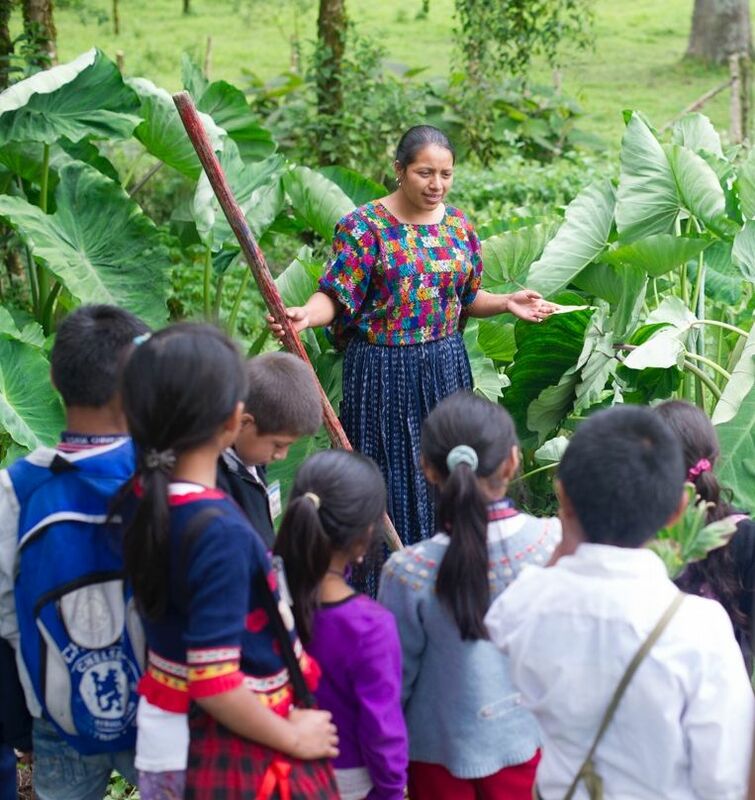 Elvira, a graduate of the Cloud Forest Conservatory, is teaching plant identification and their uses to a group of visiting students. There is also an ornithology program run by Cornell University. Many unique species of birds and plants are to be found in the adjacent rain forest. 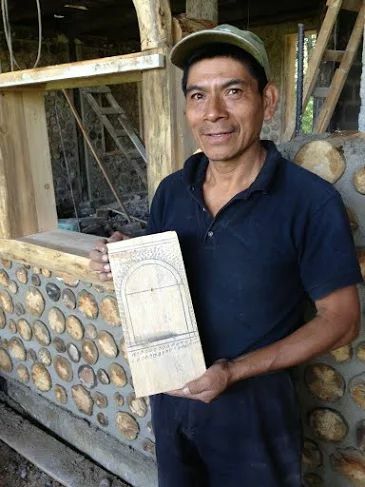 The architect of the curved window and his drawing. 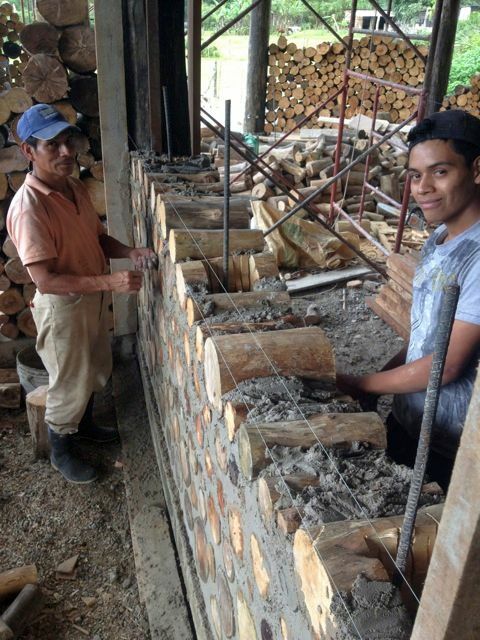 Young students were taught masonry skills to erect the buildings. The front porch is a valuable and beautiful teaching space. 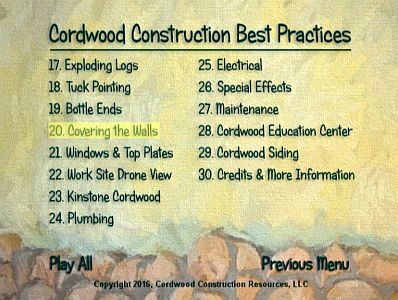 Cleaning logs for the cordwood infill. 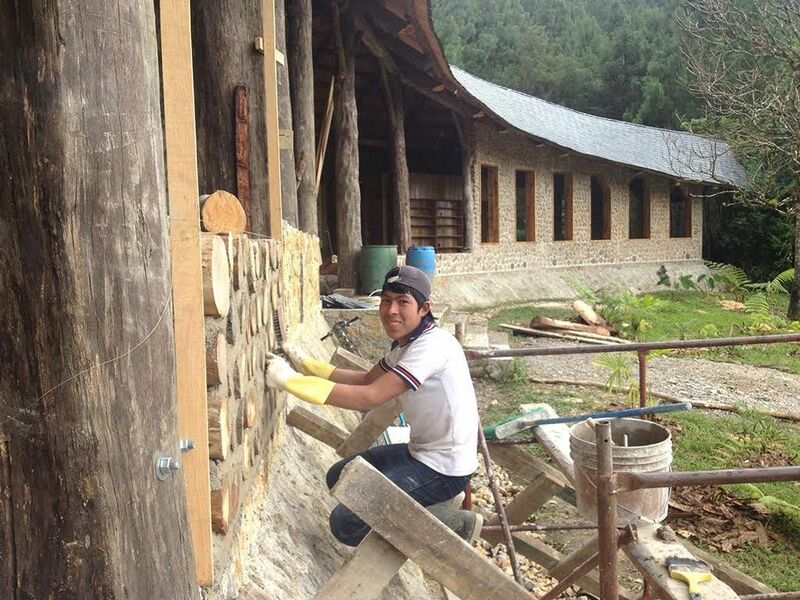 Laying the logs in mortar with an insulation cavity filled with sawdust. 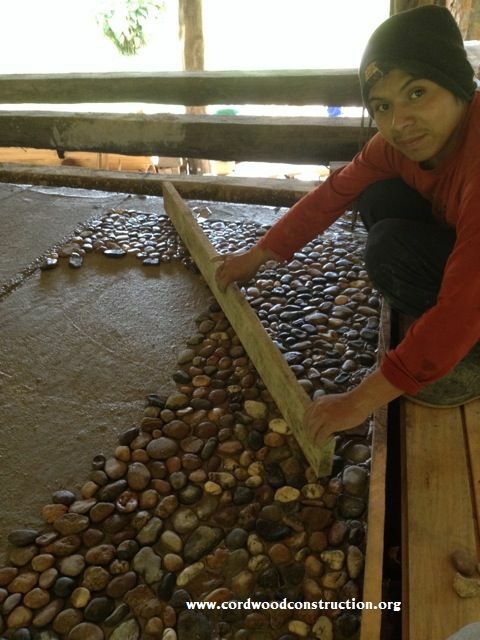 (Below) River stones were used for the shower rooms and the entrance ways. 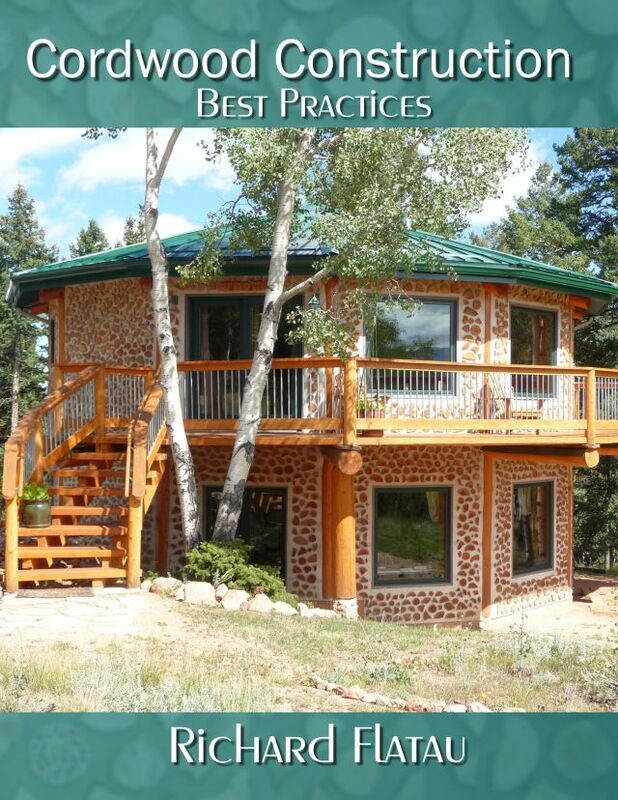 The building is framed with local, non-native, invasive eucalyptus and the cordwood infill is local pine. The local population provided the labor and were paid a fair wage for their work. 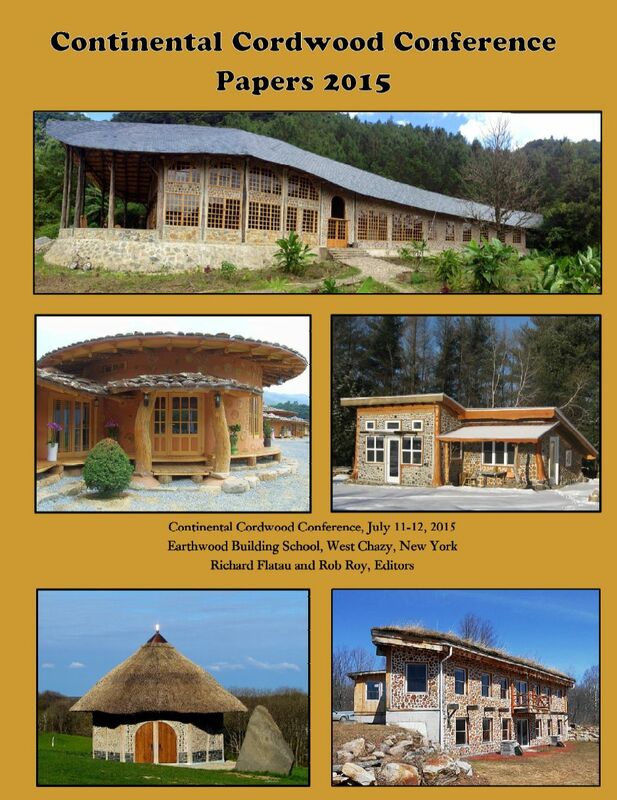 The Cordwood Conference Papers 2015 has a wonderful article about the Quetzal Cordwood Classroom. 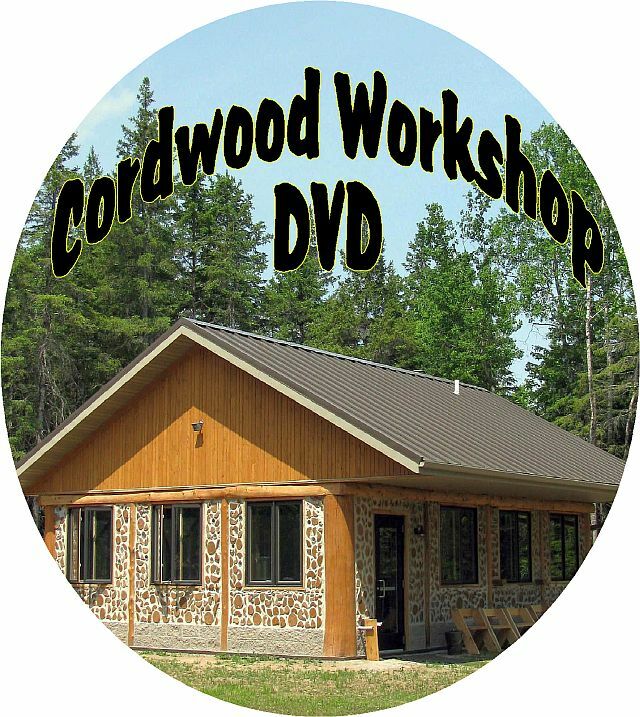 Here is a picture of the Cordwood Workshop DVD cover, featuring the best practices Cordwood Education Center. 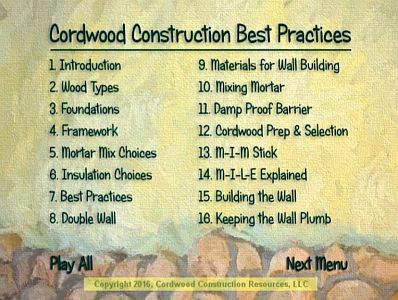 For more information on Cordwood Construction, click on the picture or visit www.cordwoodconstruction.org Below is the 30 item DVD menu.